Not only can we steal time and energy from others, we can also have it stolen from us. If you feel like other people steal your energy - consider wearing onyx. Onyx is a stone of protection which absorbs and transforms negative energy, and helps to prevent the drain of personal energy. 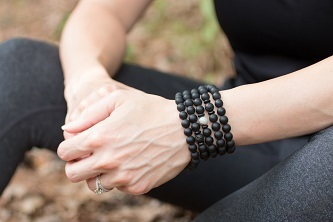 Onyx encourages wise decision making and increases self-discipline while calming nervousness, fear and anxiety. It aids in the development of emotional and physical strength and stamina, and encourages self-confidence, happiness and good fortune. 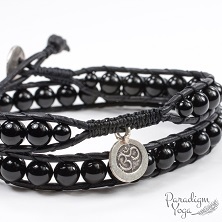 Black Onyx is a wonderful stone for grounding and centering during meditation. Onyx is available in matte and gloss finish and can be combined with other gemstones. Check out the images for some of the onyx items available in our online shop and studio. If the one you love isn't linked, message us as we will be happy to make it for you. Custom designs available. All jewelry is hand made in Jasper by an experienced yoga and meditation teacher. 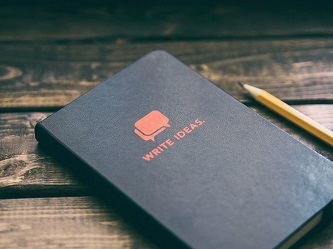 As always you do not need to share your journal responses with anyone; grab a notebook or laptop and write freely and honestly without filtering yourself. In what ways do you steal time from yourself and from others? What changes can you make to reduce how often this happens? Do you ever feel your energy being 'stolen' by another person? Does this happen with many people or a specific person? What can you do to protect yourself in future encounters with these people/this person? Are there any times where you may be stealing energy from others? What are you willing to do to balance these relationships and give back? If you find yourself in a cycle of procrastination or being habitually rushed, try adding one of these mantras to your day to encourage a more calm and considered approach to your time. "I use my time well"
"I am in control of how I spend my time"
The first week in our focus on asteya or non-stealing we're paying attention to time and energy. Consider for a moment if there are any ways that you steal time and/or energy from yourself and from others. Have you ever been late to an appointment, arrangement or meeting, whether with a professional, for business, or with a friend or family member? 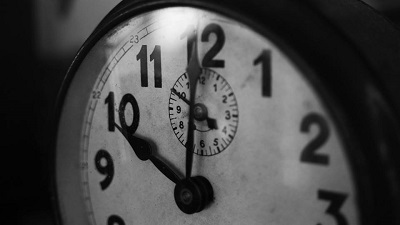 Have you ever stopped to consider that being late may be stealing time from the other person? Our most valuable asset is time, yet we often disregard other people's by being habitually late, wasting their valuable time that could've been spent on something important to them. Have you ever phoned or text someone for help with something that could easily have been looked up on google? When we ask for people's help we are taking some of their time and energy. While many people are happy to assist, be sure that when you're seeking assistance that you're not simply stealing their time and energy for something that could easily have been solved with a quick search on the super-computer in your pocket. Perhaps you steal time from yourself by being a serial procrastinator. We can spend a huge amount of time and energy thinking 'I should do this' or putting off tasks that we know we need to do. I think I could win an award for being the worlds best procrastinator so I speak from experience when I say that we really do steal time from ourselves by pondering upon, and putting off projects rather than taking action! Finally we can also steal energy from ourselves by overusing it in places that don't need it, and not keeping enough for things that are important. For example, have you ever stayed up late mindlessly browsing the internet or watching TV when you know you need to wake early the next day? Does this steal energy from the following day? Have you ever pushed too hard in the gym, yoga studio or at work only to leave yourself with no energy for activities later in the day? Our time and energy are both valuable, yet we often treat it as if it's the opposite. Even the accumulation of emails in our inbox and clothes in our closets deplete our time and energy as we find ourselves searching through them, sorting them, and taking care of them every day. This week, consider where you can simplify your life to stop stealing yours and other people's time. Maybe simplifying your wardrobe would save time and energy in the morning. Perhaps reducing the amount of emails you receive could mean less time searching, filing and deleting. Finally, each time you schedule something, be realistic with how long it'll take, including prep and travel time, and make a commitment to not stealing other people's most valuable resource by being on time. Are there any other ways that you'd like to commit to the practice of asteya regarding time and energy?